As a young Christian who wanted to enter the video game industry, I always felt like an outsider looking in. I regularly saw games and creators I admired disparage the very faith that defined the way I see the world. Titles made by my brethren for evangelistic purposes only exacerbated the issue by being derivative, tedious, or even just outright offensive, providing example after example that the idea of a ‘Christian’ game can’t work. Of these, Super 3D Noah’s Ark is one of the most infamous, and perhaps the easiest to mock. 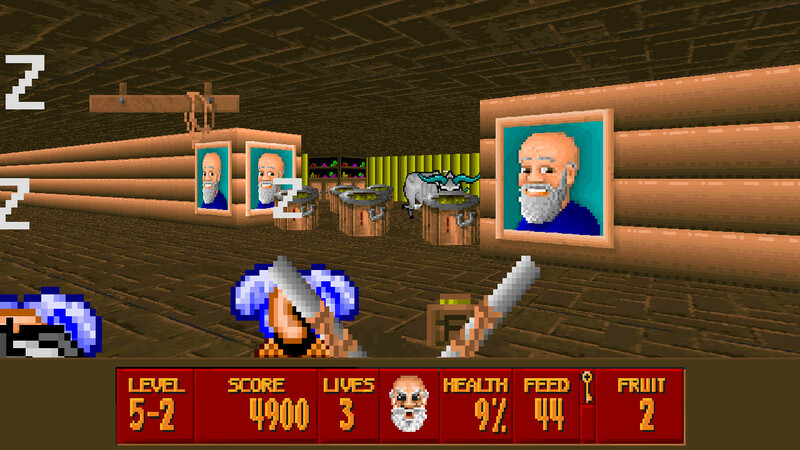 Noah’s empty, slightly constipated expression leers at the bottom of your HUD as you use a pentagram-like slingshot (among other ‘weapons’) to put animals to sleep aboard the Ark. Exuding a syrupy sweet image from the moment you see its title screen– almost a fourth of which is occupied by a Dove Foundation “Family Approved” symbol– Super 3D Noah’s Ark’s high-pitched electronic music adopts the style of a Sunday School ditty you can’t quite get out of your head. 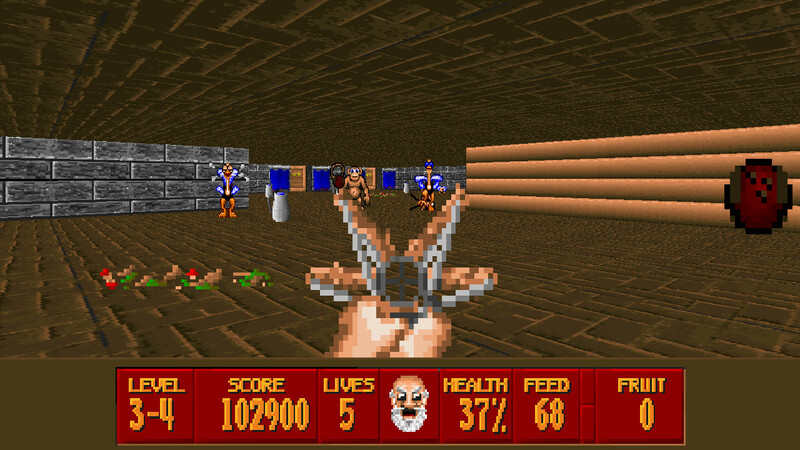 The fact Super 3D Noah’s Ark is in many ways a clone or straight reskin of Wolfenstein 3D only helped contribute to its reputation as one of the worst religious titles in gaming. I’m not going to pretend I set these thoughts, desires, and painful memories aside for the sake of forming an ‘objective,’ measured opinion. This was personal. Super 3D Noah’s Ark was one of the games I held responsible for my initially hiding my faith in an effort to be accepted. Looking beyond its many, many unfortunate bits, there’s actually a decent game here; one that took me seven years to finally find. In Super 3D Noah’s Ark’s apocryphal adventure, the animals on board the Ark escape their pens and cause pandemonium shortly before it’s supposed to land on dry ground. To restore order, you as Noah must shoot various fruits into the escaped creatures’ pixelated mouths to get them to sleep. The game is divided into six chapters consisting of five levels, every one requiring you to subdue creatures in increasingly complex maps. For example, one level contains a hallway filled with hard-hitting ostriches, while another hides angry bulls behind corners to catch players unaware. Occasionally, you’ll come across a scroll containing a Biblical question which if answered correctly will restore your health and boost your score significantly. At the end of each chapter, you face a particularly upset ‘boss’ animal (examples include bears, kangaroos, etc.) that can cause and absorb a great deal of damage. A number of feeders (weapons) found throughout the game can fire fruit at higher rates or in larger sizes to combat these threats. It’s a relatively simple formula, repeated in some form or another by first-person shooters since their inception: get weapons, defeat enemies, move on to the next area, and find special collectibles along the way. 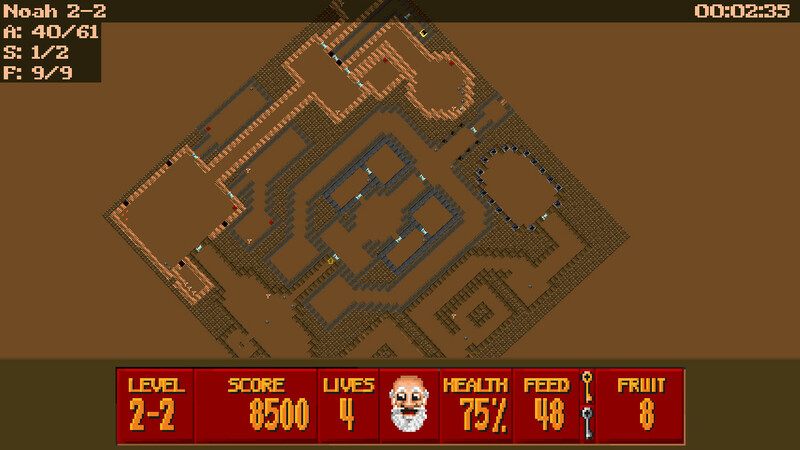 Created using Wolfenstein 3D’s engine, Super 3D Noah’s Ark retains the former’s speed and relatively simple graphics (especially by today’s standards,) without the accompanying gore or Mecha-Hitlers Wolfenstein is notorious for. From the time I was a wee young’un reading top-10 lists on my favorite gaming websites, I’d seen Super 3D Noah’s Ark bandied about as one of the worst, most unoriginal games of all time. A giant warning sign used alongside fellow Wisdom Tree title, Bible Adventures, whenever someone suggested outspoken Christian involvement in game design and production might be a good idea. After all, the most prominent examples of a ‘Christian game’ were cliched messes that pandered to mainstream Christian fear regarding the moral decay of digital entertainment…Can you blame these critics? They were right about one thing at least–it isn’t original. Aside from a coat of religious paint and a dash Bible trivia, Super 3D Noah’s Ark isn’t all that different from the title whose engine it uses. However, it is fun. I’ll admit it, exploring each map’s branching paths and revealing hidden passages behind inexplicable portraits of happy animals felt pretty great. As the game continued, I found myself focusing on careful resource management and navigation more than the fact I was essentially experiencing a bootleg religious variant of the FPS’ famous forefather. When I lost all of my lives on the first section of the last chapter (forcing me to reduce the difficulty to continue), I couldn’t help but smile. Well played, Noah. Well played. The childhood grudge I held against the game that sullied how others view my faith in the industry I love began to fall away as I sent opponents like Carl the Camel–snoozing–to the ground. Titles like Super 3D Noah’s Ark used to embarrass me as a believer. It stood as yet another example that incredible, artistic, and fun games by Christian creators such as Neon Struct (reviewed on this fine site) and David. are ignored in favor of a select few tailor-made to be laughed at. After actually playing it, though, I have a strange sense of peace. Super 3D Noah’s Ark isn’t so much a glimpse of Christian conservatism in gaming gone wrong. It’s an illustration of how a project must stand on more than its engine to succeed (a lesson we would do well to relearn in the age of Unity and Unreal 4). A symbol showing just how far the expression of Christianity in gaming has come–and how very far it still has to go. And perhaps most importantly, a reminder of how keeping an open mind can sometimes redeem even the most unBEARable of titles. This entry was posted in Uncategorized and tagged Bible, christian, christian gaming, christian review, christianity, family-friendly, gaming, God, Guest Review, indie, Indie Haven, Nelson, PC, review, SNES, Steam, Super 3-D Noah's Ark, video games and the Bible. Bookmark the permalink.